02/09/18 Subaru of america, inc. (subaru) is recalling certain 2009 tribeca, impreza, forester, wrx, legacy, and outback vehicles sold, or ever registered, in the states of alaska, colorado, connecticut, idaho, iowa, maine, massachusetts, michigan, minnesota, montana, new hampshire, new york, north dakota, oregon, rhode island, south dakota, utah, vermont, washington, wisconsin, and wyoming. these vehicles are equipped with certain air bag inflators assembled as part of the passenger frontal air bag modules used as original equipment or replacement equipment. in the event of a crash necessitating deployment of the passenger frontal air bag, these inflators may explode due to propellant degradation occurring after long-term exposure to absolute humidity and temperature cycling. 02/09/18 Subaru of america, inc. (subaru) is recalling certain 2009-2010 tribeca, impreza, forester, wrx, legacy, and outback vehicles sold, or ever registered, in the states of arizona, arkansas, delaware, district of columbia, illinois, indiana, kansas, kentucky, maryland, missouri, nebraska, nevada, new jersey, new mexico, north carolina, ohio, oklahoma, pennsylvania, tennessee, virginia, and west virginia. these vehicles are equipped with certain air bag inflators assembled as part of the passenger frontal air bag modules used as original equipment or replacement equipment. in the event of a crash necessitating deployment of the passenger frontal air bag, these inflators may explode due to propellant degradation occurring after long-term exposure to absolute humidity and temperature cycling. 02/09/18 Subaru of america, inc. (subaru) is recalling certain 2009-2013 legacy, forester, tribeca, wrx and outback vehicles, and 2009-2011 impreza vehicles sold, or ever registered, in the states of alabama, california, florida, georgia, hawaii, louisiana, mississippi, south carolina, texas, puerto rico, american samoa, guam, the northern mariana islands (saipan), and the u.s. virgin islands. these vehicles are equipped with certain air bag inflators assembled as part of the passenger frontal air bag modules used as original equipment or replacement equipment. in the event of a crash necessitating deployment of the passenger frontal air bag, these inflators may explode due to propellant degradation occurring after long-term exposure to absolute humidity and temperature cycling. 03/06/17 Subaru of america, inc. (subaru) is recalling certain 2005-2006 subaru baja, 2006-2011 impreza (including wrx and sti models), 2006-2012 tribeca, 2009-2012 forester, legacy, outback, and 2012 wrx vehicles originally sold, or ever registered, in the states of alabama, california, florida, georgia, hawaii, louisiana, mississippi, south carolina, texas, puerto rico, american samoa, guam, the northern mariana islands (saipan), and the u.s. virgin islands. these vehicles are equipped with certain air bag inflators assembled as part of the passenger frontal air bag modules, and used as original equipment or replacement equipment. in the event of a crash necessitating deployment of the front air bags, these inflators may rupture due to propellant degradation occurring after long-term exposure to absolute humidity and temperature cycling. 04/15/16 Subaru of america, inc. (subaru) is recalling certain model year 2015-2016 wrx vehicles manufactured april 10, 2015, to october 21, 2015, and forester 2.0xt vehicles manufactured april 10, 2015, to october 20, 2015. the turbocharger air intake duct may crack and possibly result in an engine stall. 07/20/15 Subaru of america, inc. (subaru) is recalling certain model year 2015 legacy vehicles manufactured march 10, 2014, to april 16, 2015, outback vehicles manufactured february 24, 2014, to april 16, 2015, impreza vehicles manufactured september 9, 2014, to april 14, 2015, xv crosstrek vehicles manufactured october 16, 2014, to april 15, 2015, and 2016 wrx vehicles manufactured march 23, 2015, and equipped with the eyesight driver assist system. if the switch that activates the brake lights fails, the automatic pre-collision braking component of the driver assist system will not function. 12/31/09 Engine Subaru is recalling certain model year 2002 and 2003 impreza wrx vehicles originally sold in or currently registered in the states of south dakota, nebraska, north dakota, minnesota, idaho, iowa, montana, colorado, wisconsin, new york, wyoming, michigan, alaska, new hampshire, vermont, and maine. during cold starts, typically under extremely cold temperatures, fuel leaks in the fuel delivery line could occur where the line connects with a rubber hose. Fuel leaks, in the presence of an ignition source, could result in a fire. Dealers will replace the fuel line free of charge. 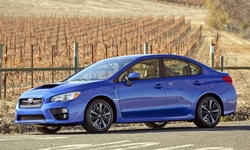 the recall began on december 31, 2009. owners may contact subaru at 1-800-782-2783. Subaru recall no. wvk-21.owners may also contact the national highway traffic safety administration's vehicle safety hotline at 1-888-327-4236 (tty 1-800-424-9153), or go to http://www.safercar.gov . 10/31/17 Electrical and Air Conditioning Subaru of america, inc. (subaru) is recalling certain 2015 wrx and wrx/sti vehicles, equipped with an optional factory-installed subwoofer in the trunk. items in the trunk may cause the subwoofer wiring to contact the subwoofer metal frame, possibly resulting in an electrical short. 07/20/15 Electrical and Air Conditioning Subaru of america, inc. (subaru) is recalling certain model year 2015 legacy vehicles manufactured march 10, 2014, to april 16, 2015, outback vehicles manufactured february 24, 2014, to april 16, 2015, impreza vehicles manufactured september 9, 2014, to april 14, 2015, xv crosstrek vehicles manufactured october 16, 2014, to april 15, 2015, and 2016 wrx vehicles manufactured march 23, 2015, and equipped with the eyesight driver assist system. if the switch that activates the brake lights fails, the automatic pre-collision braking component of the driver assist system will not function.